I was never more excited when I saw a Greater Roadrunner!!! I saw this bird a couple days last week and was taken back. We used to see Greater Roadrunners all the time but over the last few years there hasn't been many around. When I saw him again this morning I was able to grab my camera and take this picture. I'm happy that he has chosen to hang out around my house. 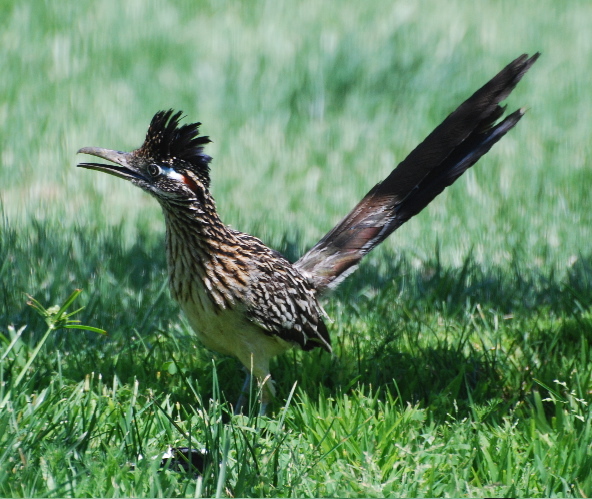 It would be awesome to have several Greater Roadrunner's hanging around here. They are the most unique bird. I love the way they move and strut around. They are like the bird "Fonzie" from Happy Days. You can just imagine them in a leather jacket riding a Harley. Very cool! It was a warm bird watching weekend! I went out with my birding buddy to The Oak Canyon Nature Center in Anaheim, Ca. to check it out. We found a secluded, shaded canyon nestled in the hills of the city with streams, oak trees, tree-covered paths, wood bridges, and of course BIRDS! There was wildlife everywhere you look. We saw tons of lizards, squirrels, and even a raccoon curled up taking a nap in some tree branches. Pretty darn cute! You can only imagine how disappointed I was when I realized that I had left my camera battery in the charger at home. What a drag! I will go back again in a few weeks and take some pictures so I can post them on my Bird Photo Page. You can check out more info on my page. It’s that time of year……We also experienced heat, bugs, and poison ivy! It was about 98 degrees and the bugs were everywhere. Flying under the rim of my visor and trying to get into my mouth, eyes, and buzzin’ my ears. That’s makes me crazy! I forgot to take my bug spray so I was kicking myself most of the afternoon. I did wear my favorite bird watching shirts so I was comfortable. I should have worn my long lightweight pants due to the Poison Ivy. I have not had a reaction from Poison Ivy before so maybe I’m immune but it’s better to be safe and avoid contact whenever possible. It's hard to enjoy a day birdwatching if you don't dress properly and bring a lightweight folding chair to take time to rest and stay still allowing the birds to come to you. My birding buddy has a birthday coming up in July so we are planning to revisit The Oak Canyon Nature Center and hopefully I will remember the camera batteries, & bug spray this time. Let's get this Bird Blog started. This whole "Bird Blog" thing is new to me and to the site, but it has to start somewhere. So, here we go. As an only child until I was 13 years of age, I learned to entertain myself. I should have no problem entering my own blogs until I get all you birders out there to join in. Actually, it should be easy for me sense I do a good share of talking to myself not only at home but also in public places. It's embarrassing at times and I have earned myself some funny looks, but it hasn't seemed to deter me a bit. Anyway, I thought I would share a funny bird watching story. My girlfriend and I were out in Ramona, Ca. at the Grasslands Reserve. We were pulled over on the side of the road looking out onto a beautiful open grass plain. We spotted some beautiful birds about 150 feet away. It was hard to make them out but I could see some detail and knew that I had never seen this type of bird before. We were real excited! They were about 10", yellow chests with a black arrow under their necks. They were open field birds and had a beautiful song. Then all of a sudden a man & wife, dressed in their "birding best", pulled their car over next to us, jumped out, and ran over with their binoculars. "What are you looking at?" the lady asked. I started, with excitement, to describe the birds to them as all four of us were eye to eye with our binoculars. Then with great disappointment she says, "Oh, their just Meadowlarks". They both hurried back into their car and drove away. My girlfriend and I looked at each other and cracked up. Hey, Meadowlarks were exciting for us. I hope I never get to be such an experienced birder that I'm bored with the likes of a beautiful Meadowlark or it's lovely song. We still tease each other about that day. As we look through our binoculars to identify a new bird and find that it’s a bird we are familiar with. We always say, "Oh it's just a mockingbird". It always gives us a good chuckle.